Crab on sugar cane (Chao Tom) makes another appearance, at left. But the show-stealer here is the Bo La Lot, or seasoned beef in a leaf. The vendor told us it was betel leaf, though Vietnamese street food experts might argue with that. 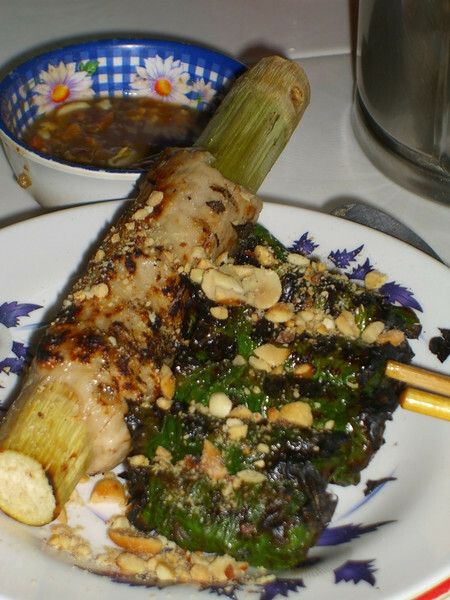 Anyhow, this grilled dish became one of our favorite snacks inside the Ben Thanh market. The beef was seasoned (nutmeg and fermented fish sauce?) and topped with roasted peanuts and a zippy dipping sauce. Read more about snackin' in Saigon.